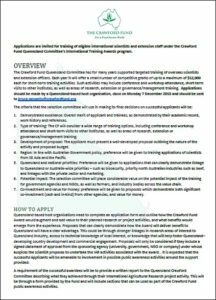 Following on from earlier in the year, when the Queensland Committee launched an award program for the training of international scientists and extension staff, a call for applications is now being made. The Crawford Fund supports the training of international scientists and extension officers in agricultural development. This Queensland training award program creates the opportunity for developing country scientists to work specifically with Queensland-based institutions in international agricultural research. The Queensland Committee is offering a small number of competitive grants (up to $12,000 each) for short-term training activities. For further information about the awards program, and to apply, please click here. For further enquiries, please contact the Queensland Committee Coordinator, Dr Bruce Pengelly. Applications close Monday 7 December 2015 and should be forwarded to bruce.pengelly@crawfordfund.org.